I’ve wanted to get my hands on this book for quite some time and the Clutch 2013 reading group on Goodreads gave me the shove I needed. Wench is the four-part story of Lizzie, Reenie, Sweet, and Mawu. They are more than wenches. 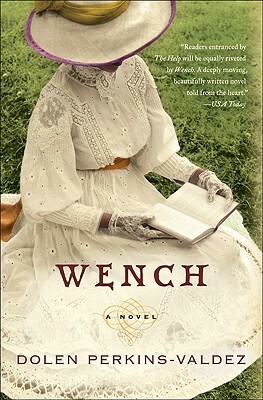 In the beginning, before the novel really starts, Perkins-Valdez depicts the change in meaning of the word wench. “In the middle ages the word wench simply meant a girl, maid, young woman; a female child, but in the United States from 1812-1832 a wench was a black or colored female servant; a negress and by 1848 the definition became a colored woman of any age; a negress or mulattress, especially one in service.”(Wench) This sets the lugubrious tone of what is yet to come in the novel. Lizzie was the only one of the four that didn’t seem to understand her place as a slave. She loved Drayle, her master, and she seemed to believe that he loved her. It is very hard to imagine that to be true, but I believe this is the main controversy of the story. At times she even imagined herself dressed as if she was a lady and tried to adopt their mannerisms. The only time she thought of freedom was for her two children, Nate and Rabbit. Mawu, however, was head-strong and determined. She didn’t mind saying what was on her mind and it was clear that freedom was on her mind from the beginning of the story. She spoke of how she tried to devise ways to discourage her master from sleeping with her. Sweet was pregnant with her fifth child, the embodiment of motherhood, whereas Reenie was the oldest of the group, trying to hide herself anyway that she could. Surprisingly, Tawawa House was not the only resort around but low and behold existed another resort not very far away for free coloreds. The slaves’ first encounter with free blacks, other than the blacks working in Tawawa House’s kitchen, was a moment of freedom in itself, yet darkened by a large dose of fear. It opened Pandora’s box. In spite of the fear, the visit sparked a desire for freedom that never stopped growing. It compelled them all to reflect on their individual situations. It was like a disease seeping into their veins for which there was no cure. How did this all affect them? You’ll just have to read for yourself and find out. The writing style was beautiful and sensitive. The descriptions were detailed, realistic, and poignant. In my opinion, the characters were endearing, but for me Lizzie was a total enigma. I didn’t feel very sympathetic toward her as a character and I was always anticipating the worst to happen when she was involved. Her character made me uncomfortable. The controversy around Wench lies there. Could there have actually been love between a master and a slave? What kinds of horrendous stereotypes go through the minds of people today when they see white men and black women in relationships? And, why? Perkins-Valdez definitely has a way with words; so much so that there were scenes that made me want to cry. Wench is heart-rending. Perkins-Valdez has painted a story that focuses quite closely on slavery in a way that hasn’t been explored in literary fiction before. This is mainly because of the taboo nature of the novel. She was inspired to write this book after reading the biography of W.E.B. Dubois where he mentioned slave masters taking their slave mistresses to a resort in Ohio. So, Tawawa House really existed. Although she could never find any documented specific stories about this place, she began to imagine what it would be like to be one of those slave mistresses. It’s a known fact that these unusual arrangements were existent and widespread among slave owners, but the resort adds a new facet, which allowed her to explore and focus on the slave mistresses. Unfortunately, I have to talk about what I didn’t like about Wench. There were two things in particular. The first problem was sometimes when she switched topics within the story, it was sometimes done with no warning. That threw me off guard at times and I found myself rereading certain passages. The second real disappointment was the ending. It fell totally flat for me, while leaving so many unanswered questions. It was as if she had no idea how she was going to end the story, especially since she’d worked so hard to spin an interesting one. Perkins-Valdez wrapped the package up, but forgot to put ribbon and a card on it. That really killed me. This is Dolen Perkins-Vladez’s first novel. She was born and raised in Memphis, Tennessee. She is a Harvard graduate and has written essays appearing in the North Carolina Literary Review and The Kenyon Review. She is currently working on her second novel.